The Latin America Memorial in São Paulo, Brazil hosted the PrêmiABT 2018 awards ceremony. The award was received by: Evaristo Mascarenhas de Paula – Diretor Presidente Adjunto Almawave do Brasil, Riemann Cesar – CTO Almawave do Brasil, Michelle Souza – Comunicação & Marketing Almawave do Brasil and Paula Santana – Superintendente de Operações AlmavivA do Brasil, alongside Maria do Socorro Rocha and Glauce Alves, representing the Caixa Seguradora team. Now in its eighteenth edition, PrêmioABT is one of the leading B2B2C (Business to Business to Consumer) platforms which, after a thorough examination, awards the companies which have demonstrated the skill of embedding values and innovation into the development of the Digital Customer Management sector. 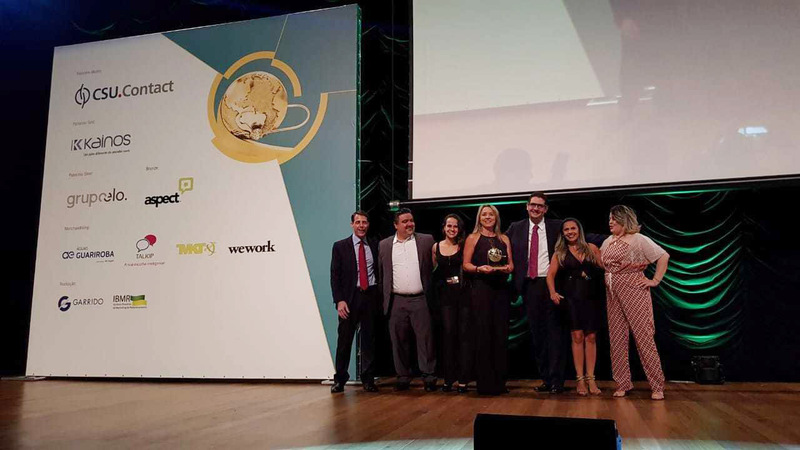 In a complex market such as South America, one of the best approaches recognised, nurtured and promoted by the Prêmio this year was the Almawave do Brasil project for Caixa Seguradora. Caixa Seguradora with Almawave do Brasil is a successful partnership based on reliability, strength and long-term vision. Through the IRIDE® CM and IRIDE® TEXT ANALYTICS solutions, which use natural language comprehension as an essential element for effective multi-channel interaction, the Client has achieved a significant improvement in the retention of users accessing the company contact centre, in operator productivity and in service excellence indexes.